WE CANNOT AFFORD TO USE PLASTIC STRAWS ANY LONGER! I cannot believe it can take up to 500 years for plastic straws to decompose! With four straws and one cleaning brush per pack, you'll be comfortably drinking from a straw without dirtying the planet or taking a chance with your wellbeing. 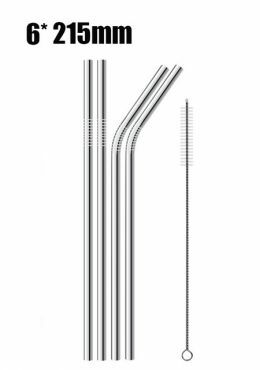 These straws are made of high-quality stainless steel, are dishwasher-safe, and reusable straws will last a lifetime! LET'S HELP THE ENVIRONMENT - ORDER YOURS NOW!